Real estate in hospital radiology departments and stand-alone imaging facilities is at a premium. 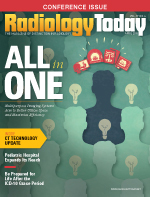 At the same time, radiologists are being asked to not only perform more diagnostic exams and more imaging procedures but also to conduct them more efficiently. Two manufacturers of imaging equipment, Siemens Healthcare and Toshiba America Medical Systems, recently introduced all-in-one imaging equipment to address this demand. At the annual RSNA meeting in Chicago in November, Siemens showcased its Multitom Rax (Robotic Advanced X-ray) system that can be used for a variety of examinations: conventional 2D X-rays, fluoroscopy, angiography, and 3D imaging. Siemens began selling the Multitom Rax in the United States earlier this year. "We call it a multiclinical expert," says Pierre Niepel, director of the radiography and fluoroscopy (R/F) segment at Siemens. "It's like a medical Swiss Army Knife because you can do many things with it in one room." Siemens developed the system because customers spoke of the need for such equipment, Niepel says. "They basically wanted to be able to do more with less and get better utilization from their imaging room and real estate investments," he says. "When you have the ability to perform a broader range of clinical applications in one room that gives you more efficiency and more productivity." In October, Toshiba unveiled its Ultimax-i FPD [flat panel detector] that allows radiography, fluoroscopy, and angiography to be performed in the same space. An earlier version of the vendor's all-in-one-system was discontinued about two years ago, says Bill Newsom, director of the X-ray/vascular business unit at Toshiba. The earlier system had an image intensifier, whereas the new Ultimax has a 17-in X 17-in FPD. Thanks to the FPD and its C-arm technology, it can fit in the same space of a typical R/F room, yet accomplish more, including some fluoroscopy and angiography studies such as peripherally inserted central catheter, or PICC, line; filter placements; peripheral angiography; and feeding tube placements, Newsom says. Manufacturers agree that the scenarios where the multipurpose equipment would be a good choice are vast. One is where the hospital has an aging R/F room and wants to expand its imaging capabilities but doesn't have the space or the money to build an angiography lab. Besides, Newsom says, not only does an angiography lab require considerably more space, it also could be more than double the cost of a multipurpose room to house a multifunctional X-ray system. "Maybe you have only one radiologist who does special procedures one or two days a week," he says. Under those circumstances, Newsom says the hospital CEO or CFO can't justify the cost of buying a full angiography lab when it won't get that much use. With multipurpose equipment, the radiologist could perform some angiography procedures and others could use the room the rest of the time for R/F procedures, he says. Likewise, Niepel sees a good fit for the Multitom Rax in medium- to large-sized hospitals that have aging multiple radiology rooms and are looking to replace one of them. "As their installed base is aging, they have to make a decision: Are you going to replace the radiography room with the same or do you want to get more out of your real estate?," he says. "Say you have three aging radiology rooms. It might be a good decision to go with the Multitom Rax for one of them because then you're not just replacing a radiography room with another radiography room but you're [also] adding capabilities." It may not be a good choice, he continues, "if you have only one radiography room, but the Multitom Rax can help you consolidate two rooms into one." The equipment manufacturers also see their all-in-one machines addressing workflow issues that are arising in today's increasingly cost-conscious health care environment. Niepel offers this example: A patient comes to the emergency department (ED) because he fell and hurt his wrist. A simple X-ray will show whether the wrist is broken. But the X-ray can be inconclusive and the patient may need a 3D CT scan to determine what's really going on. With this multipurpose room, the patient can stay put and undergo a 3D CT scan. "With the Multitom Rax, you can keep the patient in the room and the benefit is you're not occupying the time of the CT scanner where you want to do more important/relevant studies," Niepel says. The image can be taken at the same system, so the patient doesn't have to wait for an opening to be transferred to the CT unit. The Ultimax-i can help relieve conflicts for a department that already has a rather busy angiography schedule, Newsom says, noting that the multipurpose room can handle the simpler procedures that require angiography and leave the more complex cases that could take hours to perform to the full angiography lab. The Multitom Rax is also a good product for orthopedic imaging, says Viola Fernandes, product manager at Siemens. "What is unique about the system is that [it] offers the option—in combination with the company's additional workstation, known as syngo X Workplace—of performing 3D scans in a natural weight-bearing condition," she says. "That means the patient can lie, sit, or stand—in other words, they can assume whatever type of position they feel the pain the most." Images taken while a patient is standing may be necessary because certain joints and the spinal column appear differently under the influence of the patient's body weight compared with when the patient is lying down, Fernandes says. "A more traditional CT room doesn't allow you to do that," she says. The 3D option requires a separate workstation, Niepel notes. The 3D option for the Multitom Rax has not yet been submitted to the FDA for clearance. Trauma imaging is another excellent use for this new category in medical imaging, manufacturers say. It could be ideal for a small critical care hospital, Newsom says, citing the following example: A patient is in a car accident and brought to the ED. The patient is taken to the multipurpose room for imaging to determine whether he has internal bleeding. The all-on-one allows the ED physician and interventional radiologist to provide the necessary trauma relief quickly and efficiently, Newsom says. The University of Utah Health Care system is installing a Multitom Rax at its University Hospital in Salt Lake City sometime this summer. Satoshi Minoshima, MD, PhD, chair of radiology and imaging sciences at the University of Utah School of Medicine and University of Utah Health Care, anticipates the multipurpose device to be most useful in orthopedic and trauma applications. While the true value of the device has to be explored further he expects to take advantage of its ability to acquire plain radiography and 3D images without having to move patients and to image patients standing, sitting, or lying down. Minoshima says when he saw a demonstration of the Multitom Rax at RSNA 2015, he knew it would be ideal for one of the hospital's many X-ray rooms. Is the quality of the images from cone beam CT on hybrid systems as good as from state-of-the-art CT scanners? "Absolutely not," says Alan H. Matsumoto, MD, FSIR, FACR, FAHA, a professor of radiology and chair of the department of radiology at the University of Virginia. However, Matsumoto says, "they are pretty darn good," and for that reason he sees them having a valuable role in certain procedures, particularly those in IR. For example, he says, hybrid equipment with cone-beam CT technology integrated into fluoroscopic units with good road mapping, vessel navigation, and image fusion/overlay software programs is well suited for assessing the adequacy of treatment for pathologies such as arterial aneurysms (brain, viscera, aorta), benign and malignant tumors (liver, kidney, brain), and other diseases such as benign prostatic hypertrophy. The ability for these hybrid units to provide 3D visualization of the pathology allows the interventional radiologist the ability to monitor the adequacy of the intervention (ie, complete exclusion of the aneurysm with coil embolization, complete ablation of the cancer with thermal energy, or complete devascularization of the pathology with embolization), Matsumoto says. Most importantly, he adds, it allows the interventional radiologist to make adjustments to the treatment plan in real time if the images obtained from these hybrid units demonstrate an incomplete therapeutic effect. In addition, Matsumoto says, evaluation for a complication such as bleeding can performed quite easily (ie, assess for an intracranial bleed during treatment of a brain aneurysm). He also sees a potential future application with the all-in-one imaging equipment for surgical procedures that require skeletal reconstruction such as occurs with severe facial or pelvic trauma. The installation requirements of the Multitom Rax are really no different from similar imaging equipment, Fernandes says. An ideal room size would be about 17 ft X 17 ft to allow for some wiggle room. However, she says, "There are no restrictions in terms of room size." The Multitom Rax consists of two ceiling-mounted arms that can be moved into position automatically using robotic technology. The system is designed for all patient types, including children, older adults, and large individuals. The multipurpose systems also address another concern in health care today: ergonomics. Because the system—not the patient or examining care team—moves when needed, it offers both full access to the patient and safety for all involved during its use, Niepel says. The smaller size of an R/F multipurpose room could be a disadvantage if the patient is quite ill and is on a ventilator or connected to other life-saving apparatus, Newsom says. "If you have a complicated case where the patient is on a respirator and has an anesthesia cart connected with them, it could be a tight squeeze," he says. Still, Newsom says, the wide range of applications and its ability to optimize clinical work processes make it worthwhile in the right settings. He expects that the number of installations of multipurpose equipment will continue to be smaller than for full angiography suites but it definitely has its time and place. — Beth W. Orenstein is a freelance medical writer based Northampton, Pennsylvania. She is a regular contributor to Radiology Today.